One of the things a lot of people find difficult when starting out on a gluten free diet is learning to cope with what they can’t eat, instead of focusing on the huge array of gorgeous and nourishing foods that they can eat. By changing your approach and by giving more attention to all the foods you CAN eat, you will begin to see a shift and everything in your life will become much easier. One of the easiest ways to keep a positive attitude is to keep a really well stocked pantry, of all the foods you can eat and to no longer buy the ones that you can’t. I can’t imagine what it would feel like to live in a house where I wasn’t able to eat half of the food in it, so don’t surround yourself with that kind of negativity because it’s really no fun having a kitchen full of food you can’t eat and trying to resist temptation every single day. A fear or misconception that many people have is that gluten free foods are tasteless and boring, but this is truly not the case! Yes, there are many cardboard-like GF breads and crackers out there on the supermarket shelves, but there are also loads of other, healthier options that are quite delicious. By having the following foods readily available in your pantry, this will make it easier for you to whip up easy, tasty and nutritious meals and allow you to avoid processed, packaged foods that are WAY less nutrient dense. Did you know that many foods are naturally gluten free? Choosing fresh whole fruits, vegetables, eggs, quality meats and seafood, along with the extensive list below can save you money, and give you peace of mind that you are eating cleaner and making healthier choices for you and your family. Another tip: Stock up and save! If you see something in bulk that is reduced, try stocking up so you won’t run out and be forced to pay a higher price tag later for the same item next time. You can store excess flours, nuts and seeds in the freezer to extend the shelf-life too. Do you have a gluten-free, wholefoods based diet? 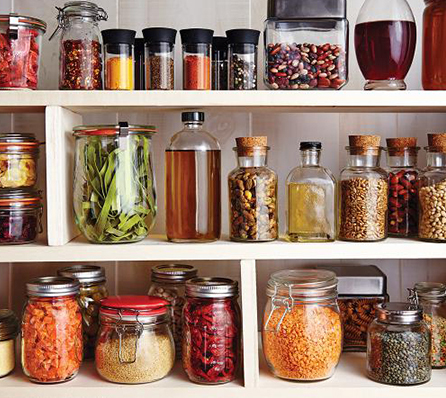 What pantry staples are in your kitchen that didn’t make it to our list? Unfortunately when you’re going gf and you have 2 teenage sons and a husband who despite eating what you cook and buy also insist on having ‘normal’ food you are surrounded by some food you’re not allowed to eat. I do slip up at times however I do have plenty of what I can eat. And I do enjoy trying out new recipes. I think a lot of people are in my situation so to say you can’t imagine living in a house where there is food you can’t have is unrealistic. People will think ‘she doesn’t understand ‘ and my question to you , do you? Thanks for sharing excellent informations. Your web-site is extremely cool. I’m impressed by the details that you have on this web site. It reveals how nicely you perceive this topic. Bookmarked this web page, will come back for extra articles. You, my pal, ROCK! I found merely the info I already searched all more than the place and simply col&dnu#8217;t come across. What a perfect web-site. It depends on the reason you are going GF. If it’s because you’re coeliac or non-coeliac gluten sensitive (NCGS), then your family members are just going to have to understand that NO gluten makes it through the door. Seriously. It’s your long-term health that’s on the line here. If you want to try going GF because of basic health benefits, then obviously that’s your choice. But can I say that it’s WAY easier when everyone in the house is on board with this. Tiny grains of gluten get on everything – and if you’re either wanting to be entirely GF or you need to because you have an autoimmune issue (ie coeliac), then tiny little bits of gluten floating around on the chopping board, the kitchen bench, the cutlery drawer or the pantry shelf can be highly problematic. Choosing to go GF is one thing, needing to for your everyday health is an entirely different kettle of fish. Given I’m either NCGS or Coeliac, the tiniest amount of gluten has a bad effect on me. I’m a Nazi about avoiding it. It’s horrible to have to be, but the effects of coming into contact with gluten for me are NOT worth the pain and misery of trying to be socially acceptable! When I was dgx. wheat intolerant I began researching and studying what I need to do and then implemented my new life style. Soon my 5 auto immune diseases were gone and I lost the 24/7 pain in my entire body. I was really encouraged so I made a number of good meals…soon my husband who by nature one of the most STUBBORN AND RESISTANT people I have ever known wanted what I was eating…now we both feel about 98% better and stick to our new “way of life” gluten free and sugar free. It is not that hard. I’m going gluten free due to my thyroid, but I still cook pasta etc for my husband and 2 sons. It hasn’t been at all difficult but I think I’m very resilient end sdspt easily. So I do zucchini noodles just for me yo go wiyh meatballs etc. If I make Lasagne I subdtitute the pasta sheets with thin zucchini slices snd it actually tastes better.